Superior load-breaking ability and balance. Double welded 1-1/4" diameter steel pipe frame handles virtually every type of poly drum. Frame is 61" high x 23" deep. Standard Truck designed for all poly drums except overpacks. 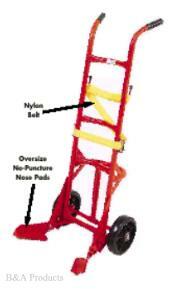 Universal Truck has longer nylon belt and handles all types of poly drums, including overpacks.